Mud City, the final volume in Deborah Ellis’s Afghan trilogy, follows 14-year-old Shauzia, Parvana’s best friend, into a refugee camp in Pakistan. 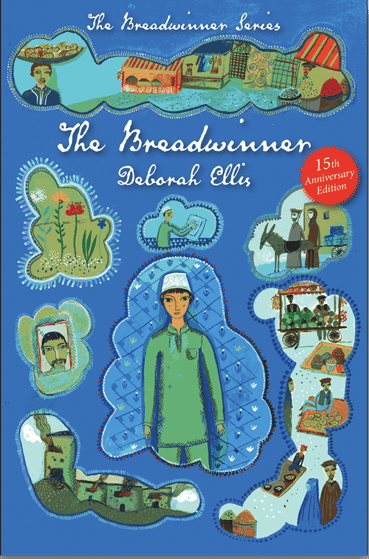 Having fled an arranged marriage in Kabul, Shauzia becomes little more than a gopher for Mrs. Weera, her former phys-ed teacher, who’s in charge of the widows’ compound at the camp and a tireless worker for a better future. But Shauzia still dreams of escaping to France and putting the horrors of her life behind her, so she leaves the camp with her dog Jasper and tries to fend for herself on the dangerous streets of the nearby city of Peshawar. When she’s wrongfully accused of theft and thrown into prison, she’s rescued by a well-meaning American family, but that sours when she tries to emulate their generosity and, instead, incurs their disapproval. Returning to the camp, Shauzia slowly discovers that, like Mrs. Weera, she likes helping people and can make a difference in their lives. She doesn’t give up her dreams but realizes that they can wait until she’s ready for them. Like its predecessors, The Breadwinner and Parvana’s Journey, Mud City is a stunning portrait of a totally devastated world where children are forced to fend for themselves, often at the mercy of adults who have abdicated all responsibility. Ellis succinctly guides readers through the complex worlds of the refugee camp, the streets of Peshawar, and the luxurious house of the Americans, without ever being judgmental. She’s grown tremendously as a writer in this trilogy and nowhere is this more clear than in her portrait of Shauzia. Ellis has imbued her with a strong sense of self that’s particularly important since Parvana is a shadow in the background. As always, Ellis balances tragedy with rare comic moments. She takes obvious pleasure in Shauzia’s antics with Jasper – in the way she opens the doors of the Americans’ house to anyone who rings at the gate, and even in her ongoing battles with Mrs. Weera. The result is a novel that resonates imaginatively.